The Nesbitt Biology Building is state of the art with open architecture to foster collaborative work and invite interaction between scholars. Design features such as open laboratories, lounges used by both students and faculty, and faculty offices clustered in a central area, promote an atmosphere of shared learning. This manifests itself in close faculty-student research collaborations, as well as friendships. Extensive computing equipment is available both within the department and through the High Performance Computing Virtural Laboratory. 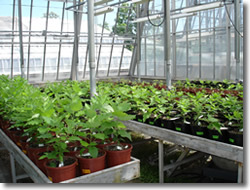 Carleton University has one of the best university greenhouse complexes in Canada, with two large display houses, and three research houses. The display houses are open for public viewing weekdays: 9:00 a.m. to 4:00 p.m. The research houses are used for experiments by researchers from Carleton and from other places. This facility houses a Zeiss Axiophot equipped for phase, fluorescence, DIC, video enhanced contrast DIC (VEC-DIC), polarizing and reflection interference microscopy. Digital imaging is possible with either scope using a cooled RGB high resolution CCD camera. Shared equipment housed in the Department includes several refrigerated preparative centrifuges, a Beckman tabletop ultracentrifuge, two full-size ultracentrifuges, a liquid scintillation counter, two gel documentation systems and a sonifier cell disrupter. In addition, the Department has a Biorad Imaging system complete with software for phosphor radioisotope imaging as well as gel and blot analysis using fluorescence and chemiluminescence detection methods. Plant growth chambers are housed in several locations within the building and include two walk-in temperature/light/humidity plant growth chambers and several individual incubators. For ecological studies, the terrain of Eastern Ontario and Western Quebec offers innumerable streams, ponds, bogs and extensive deciduous and coniferous forests. Several areas owned by the university are available for teaching and research. The nearby Algonquin National Park is used extensively for teaching and research by Carleton faculty and students.